Skyxe Saskatoon Airport has instituted flat rate for taxi trips to the airport from different areas of the city. Saskatoon's airport authority has instituted flat-rate pricing for taxi trips to the airport from different areas of the city. The flat-rate pricing, which only applies to taxi providers licensed by the airport authority, came into effect on Jan. 17. According to Skyxe, the airport authority, the most expensive rides within city limits will be to the airport from areas such as Stonebridge, Lakeview and Rosewood, where the trip will cost you $41. As for outlying communities, a trip from Martensville will cost $35, and if you are in Warman the price tag is $50. In a release, the not-for-profit airport authority said having a flat rate based on where you are in the city is common among most major airports in Canada. The flat rate includes a $2 airport taxi trip fee. That's a fee that is directed into airport road infrastructure and curbside operations for commercial service providers. The authority said the flat rate will provide transparent pricing for travellers. A taxi company official had no comment. 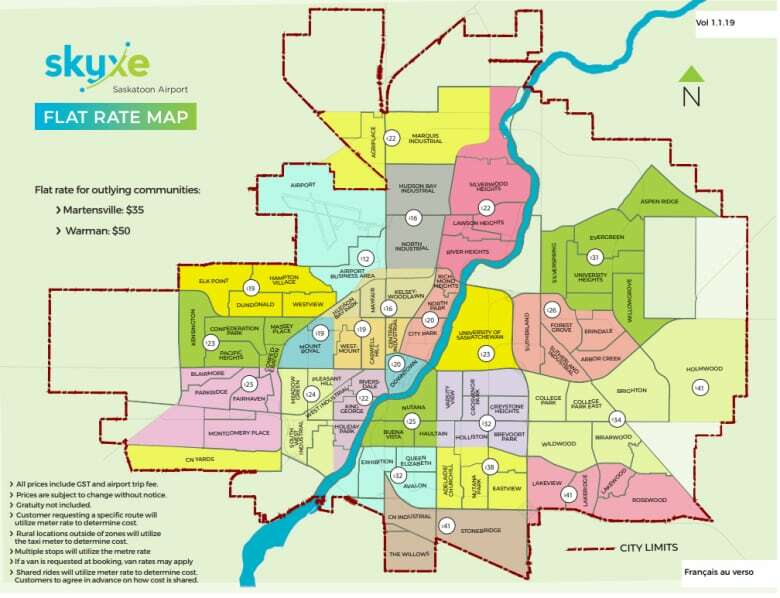 The change comes at a time when ride-hailing services, like Uber and Lyft, are likely to soon begin operations in Saskatoon. The province and the city passed legislation in December that gives the green light for transportation network companies to operate in Saskatoon. Representatives from Lyft and Uber have not said when their companies will have cars on Saskatoon's roads. Local taxi companies have argued before city council that the ride-hailing services would lead to an unfair playing field.